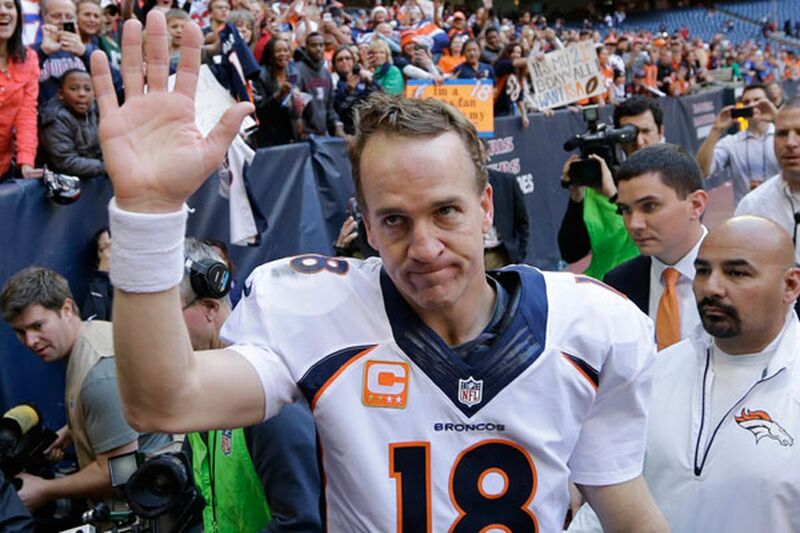 IMAGINE Peyton Manning stepping to the podium to receive his award for winning the 2013 fantasy football MVP. He grabs the microphone and thanks Dr. Robert Watkins and former baseball star Todd Helton. Watkins is the surgeon who repaired the herniated disk in Manning's neck in 2011. It was Manning's fourth neck surgery and came during a labor lockout, forbidding Manning from using the Colts' facilities for rehab. That's when Helton, a college teammate of Manning's at Tennessee, invited him to Denver to work out and be monitored by the Rockies' medical staff. Manning, who wound up missing the 2011 season, loved Denver so much, he signed with the Broncos the following season. This year, he returned to the top of the fantasy mountain by breaking Tom Brady's 2007 record with 51 touchdown passes. He needs 266 yards to break Drew Brees' 2011 single-season yardage record of 5,476. Manning has thrown for 300 yards eight times and 400 in four others. He has only 10 interceptions in 631 attempts. Brother Eli Manning had 10 interceptions before Halloween. New Orleans' Brees, Eagles running back LeSean McCoy and Kansas City running back Jamaal Charles finished well behind Manning for MVP consideration. The football Manning threw last week for touchdown No. 51 became an instant piece of NFL treasure to everybody except the guy who caught it. Tight end Julius Thomas celebrated the touchdown with an emphatic spike, but teammate Eric Decker scurried to retrieve the ball and keep it safe for the historians. "It wouldn't surprise me if Julius would have handed the ball to some babe up in the stands and tried to get her phone number in exchange for the ball," Manning joked. "That would be right up Julius' alley." Upon further review, that's probably a more interesting anecdote for Manning to tell rather than thanking his gifted but obscure doctor and the retiring baseball player who hit only .249 this season. Least valuable player: Trent Richardson, RB, Browns/Colts. Also considered: Ray Rice, RB, Ravens; C.J. Spiller, RB, Bills; Victor Cruz, WR, Giants. Best in-season pickup: Alshon Jeffery, WR, Bears. Also considered: Nick Foles, QB, Eagles. Most improved: Josh Gordon, WR, Browns. Also considered: Ryan Tannehill, QB, Dolphins; Ryan Mathews, RB, Chargers; Andy Dalton, QB, Bengals; Jordan Cameron, TE, Browns. Best rookie: Eddie Lacy, RB, Packers. Also considered: Zac Stacy, RB, Rams; Le'Veon Bell, RB, Steelers, Keenan Allen, WR, Chargers; Giovani Bernard, RB, Bengals. Most clutch performance: Chiefs RB Jamaal Charles' scoring five touchdowns in Week 15. Also considered: Ravens K Justin Tucker's six field goals in Week 15, including ones from 53 and 61 yards. Biggest early-season mirage: Chargers WR Eddie Royal, who had five touchdowns in the first 2 weeks and only two the rest of the season. Also considered: Giants QB Eli Manning, who had 450 yards passing and four touchdowns in Week 1, but was mostly a disaster afterward. Most damaging injury: Aaron Rodgers, QB, Packers. Also considered: Julio Jones, WR, Falcons; Rob Gronkowski, TE, Patriots. Steelers quarterback Ben Roethlisberger is 16-1 all-time against this incarnation of the Cleveland Browns, including 8-0 at home. Who is the only new Browns starting quarterback to beat him? Hint, it's one of these guys: Colt McCoy, Brady Quinn or Derek Anderson. Quarterback: Aaron Rodgers' return to the lineup Sunday will make things difficult for fantasy leaguers who've gotten this far without him. Complicating things is Sunday's juicy matchup against a Bears "D" that was carved up by Nick Foles (21-for-25 passing) last week . . . Arizona's Carson Palmer needs 133 yards to become the first quarterback in history to throw for 4,000 in a season for three teams. He did so previously with Cincinnati and Oakland. Running back: The Texans will trot out their fifth stringer after Dennis Johnson missed practice again yesterday with a hip injury. Up next is Jonathan Grimes, a second-year pro out of William & Mary. He follows Arian Foster, Ben Tate, Deji Karim and Johnson. Wide receiver: The return of Rodgers means an obvious bump for Green Bay's Jordy Nelson, James Jones and Jarrett Boykin. Randall Cobb, out since Week 6 with a broken right fibula, also could get back in the lineup. Brady Quinn is the only new Browns quarterback to beat Ben Roethlisberger. Quinn was an electric 6-for-19 on that Thursday night in 2009 when the Cleveland beat the Steelers, 13-6, to set football back about 50 years. Kyle Orton likely replacing Tony Romo could be just what slumping Dallas tight end Jason Witten needs. In the five games since the Cowboys bye in Week 11, Witten has just 14 catches and was held under 55 yards four times. Four of his catches have been touchdowns, however. The Eagles have given up just two touchdowns to opposing tight ends (Green Bay's Brandon Bostick and Arizona's Jim Dray) and just one 100-yard game (San Diego's Antonio Gates). Ed Barkowitz, who is sick of Michael Bolton's Honda commercials, has been writing about fantasy football in the Daily News since 2001.